Isleham is a small village in the Fens area of Cambridgeshire which, as the name suggests, is a natural marshland. The town itself is home to just over 2,000 people and some very nice properties. 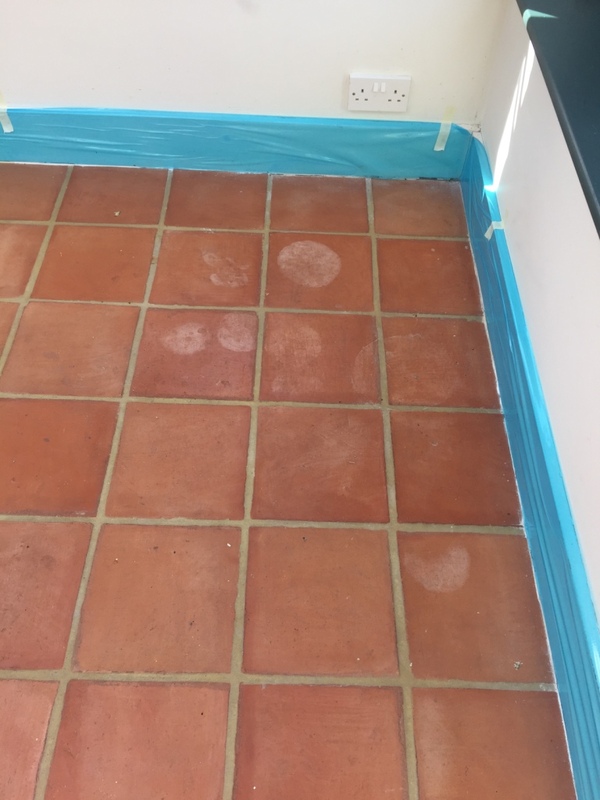 I recently visited a customer in the town who contacted me after finding our website because her Terracotta tiled conservatory and utility room had become worn and stained due to leakages from plant pots and other various spillages. 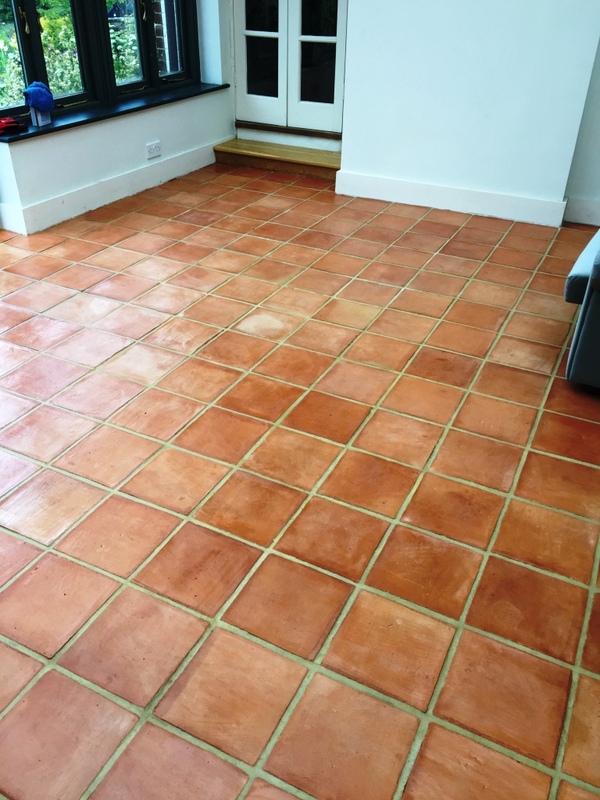 Terracotta is a highly porous stone and so has a strong propensity to absorb stains, and dirt can easily become ingrained. This problem is easily exacerbated when the sealer has worn away and can no longer adequately protect the stone. These tiles were now due for deep clean and reseal, and I was more than happy to oblige. My first action, before beginning the restoration, was to tape up all the walls and wood features around the conservatory and utility areas with our décor protection film, to protect them from getting damaged. 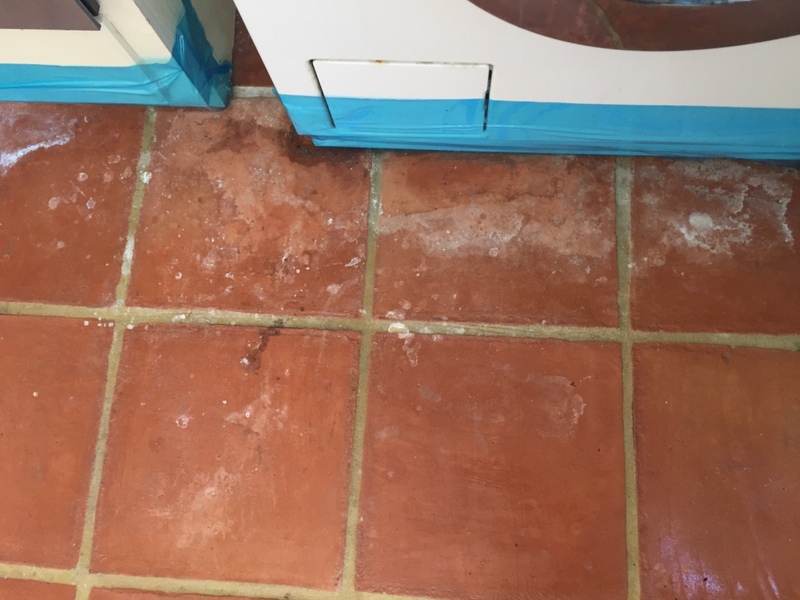 Then, to begin, I applied Tile Doctor Pro Clean – which is our high alkaline cleaner – across the floor to strip away the old sealer and to provide an initial clean. The product was left to dwell for 10-20 minutes before being worked into the pores of the stone using a firm scrubbing brush fitted to a rotary machine. 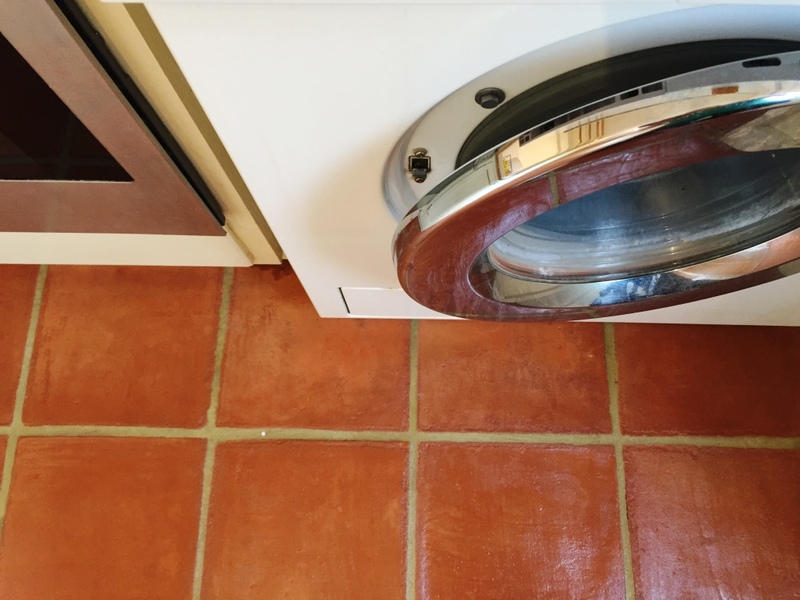 Next, I removed any deep staining using Tile Doctor NanoTech HBU, a potent cleaner which contains nano-sized particles to penetrate the pores of the Terracotta to dissolve and lift out the embedded stains. I also used this product to remove the very stubborn salt deposits in the utility room – although it took three to four attempts. 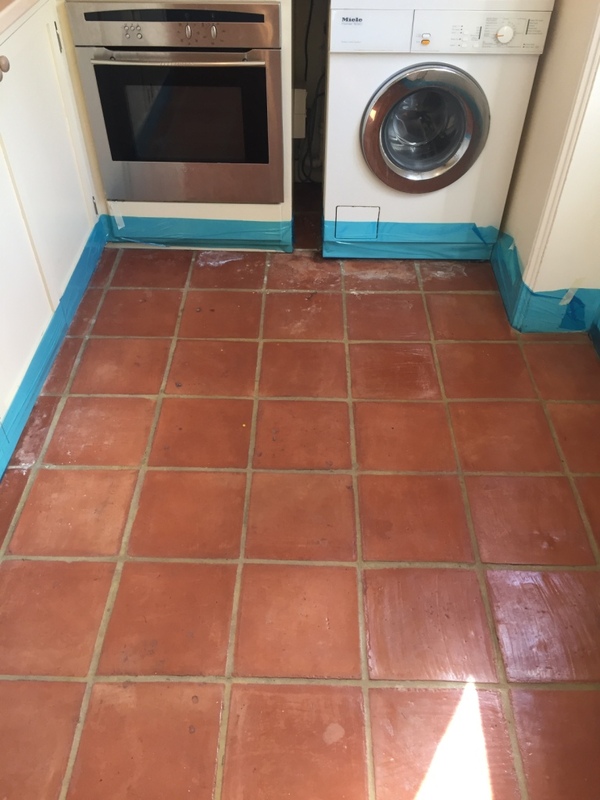 To complete the cleaning process, I gave the grout a light clean using Tile Doctor Grout Clean Up, which is a concentrated phosphoric acid cleaner designed to remove grout haze and any deep staining in the grout. The floor was then dried down with cloths and air-movers, and left over the weekend to make sure any excess moisture had evaporated. 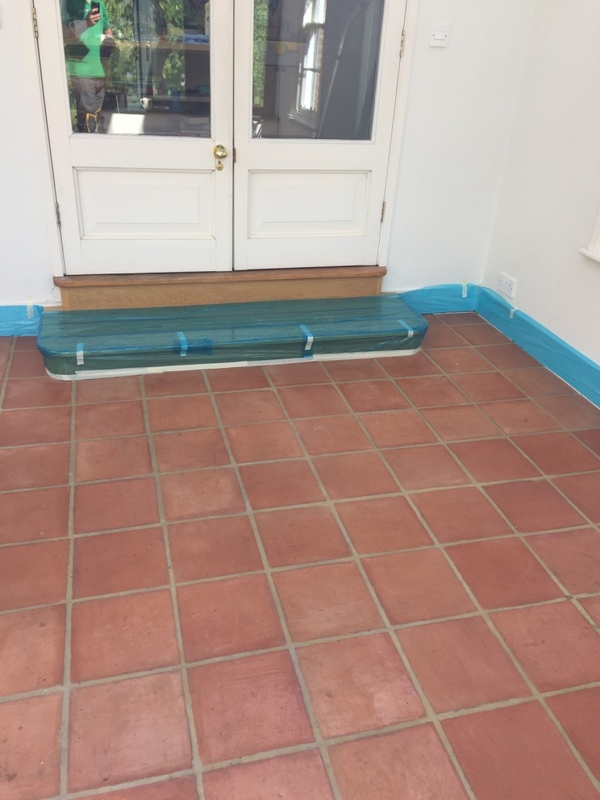 Upon returning to the property at the beginning of the week, I sealed the floor firstly using one coat of Tile Doctor Ultra-Seal, followed by five coats of Tile Doctor Seal and Go Extra. Ultra-Seal is a penetrating sealer which fills the pores of the stone to protect against staining and ingrained dirt. It is also fully breathable and allows for moisture vapour transmission. Seal and Go Extra provides further protection and a durable and aesthetically pleasing low-sheen finish to really improve the overall look of the floor. 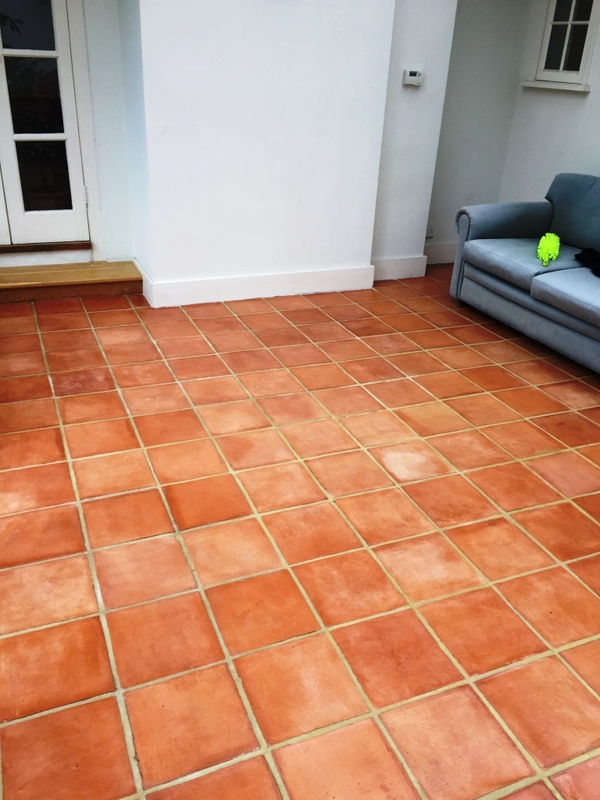 The customer absolutely loved her newly restored Terracotta tiles and was amazed by the transformation. I’m sure she is looking forward to spending time in her conservatory over the course of the summer months.